Samudra Tupa Glacier is one of the largest in the Chenab Basin, India . Pink arrow indicates the terminus in a glacier lake and A mark the accumulation zone with the red line indicating the equilibrium line in 1998. In a glacier inventory in the basin by Kulkarni et al (2007) the 466 glaciers in the basin were observed to have lost 21% of their total area from 1962 to 2001. 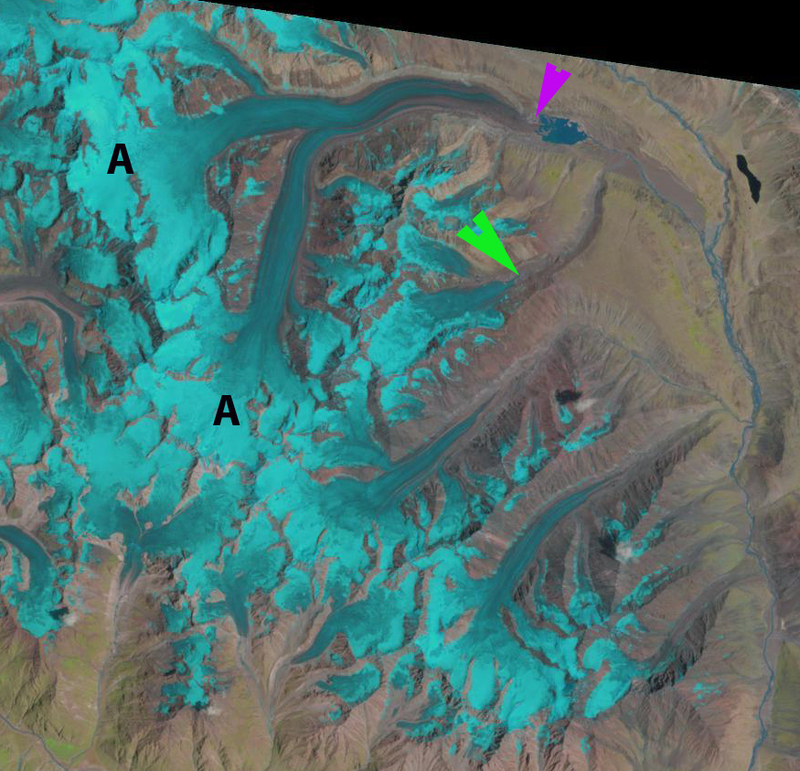 This program coordinated by the Space Applications Centre of the Indian Space Research Organization, has combined field observations of the glacier with remote sensing to observe the changes in area and length of the glaciers, immediately below is a 2006 picture of the glacier terminus and proglacial lake from Kulkarni. . The terminus ends in an expanding proglacial lake. The lower glacier is heavily debris covered, has a low slope and is essentially stagnant. These factors will lead to continued retreat. 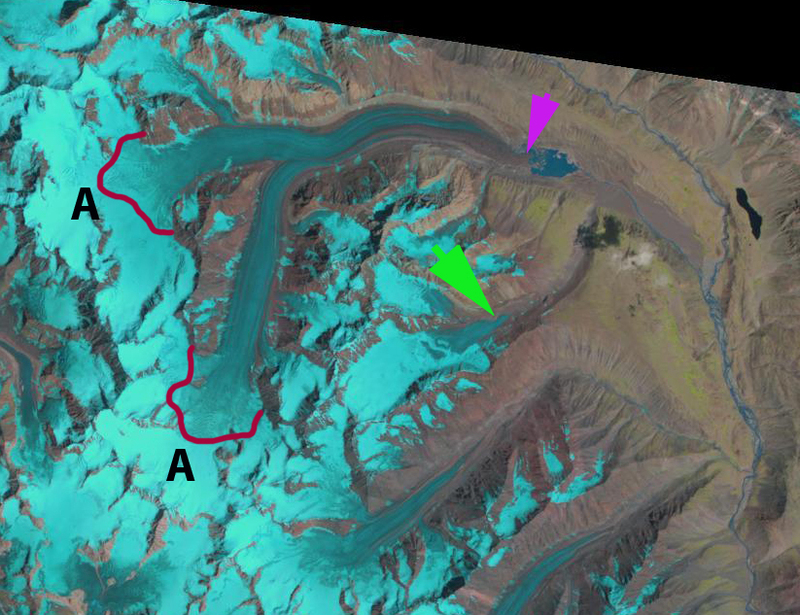 In this post we use 1998, 2002 and 2011 Landsat imagery to examine the terminus of this glacier. The glacier terminates at 4225 meters, the snowline in 1998 is 5200 meters and 2002 is 5300 meters, neither of the images is at the end of the ablation season. An ELA of 5200-5300 meters leaves an accumulation area insufficient to maintain the current glacier size. In 1970 the ELA was at 4900 meters Kulkarni et al (2007) . 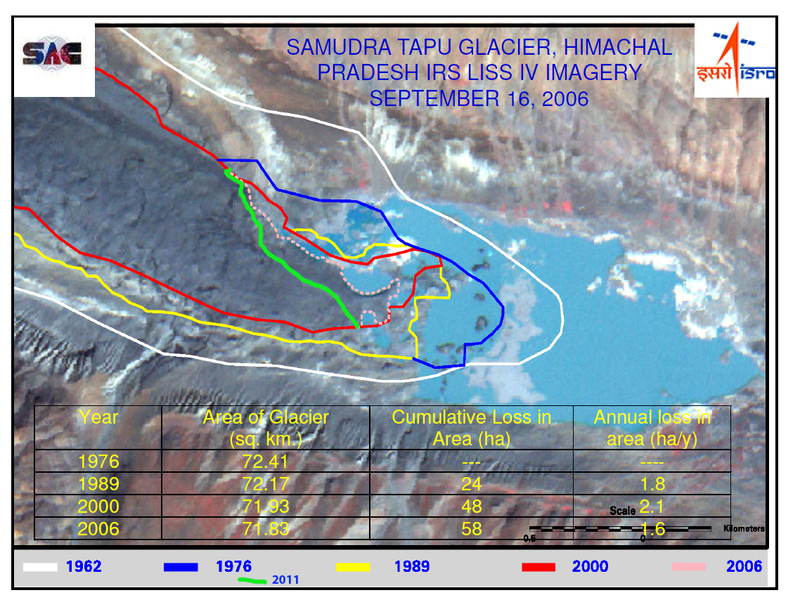 A close up view of the termini of Samudra Tupa-pink arrow and a nearby unnamed glacier-green arrow indicate the changes in 1998, 2002 and 2011 in that order. 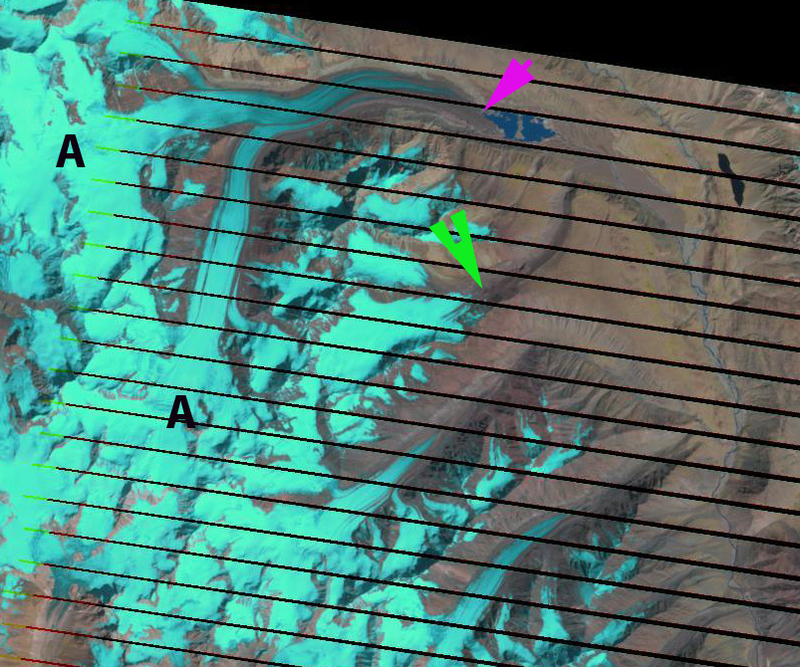 The green arrow points not to the terminus but to a prominent knob near the end of the glacier in each image, it is the control point. The last two images illustrate the changes from 2002 to 2011 in an image overlay. 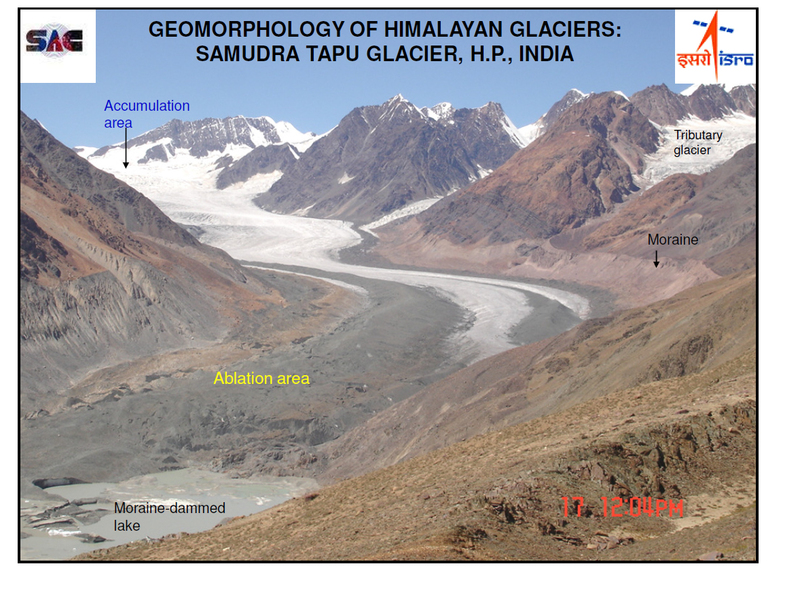 The last image is the 2011 termini of Samudra Tupa Glacier from (Kulkarni, 2009). The retreat is noted by Kulkarni, 2009 as 13 meters/year during the study period. From 2002 to 2011 the glacier retreated nearly 200 m, closer to 20 meters/year. The retreat of this glacier is less than that of other large glaciers nearby Sara Umaga and Gangotri. The loss in glaciated area in the basin of 21% is also similar to other areas in the Altai, Tibet, Nepal Himalaya, Khumbu Nepal and Tien Shan.